I eat them at breakfast. I eat them at dinner. I eat them at brunch. That I never get sick. If you do not have buttermilk, then as a homemade substitute, simply combine milk and lemon juice in a medium bowl and set aside for 5 minutes to curdle. In another mixing bowl, combine flour, sugar, baking powder, baking soda and salt. Whisk the egg, melted butter and sour cream into the bowl with the buttermilk. Pour the flour mixture into the wet ingredients and mix until the mixture is just combined. Do not over mix. The batter should still be lumpy. Heat a large skillet over medium-low heat and coat with butter. Ladle 1/4 cup of batter into the skillet and cook until bubbles appear on the surface. Flip and cook the other side until golden brown, about 2 minutes. Keep the pancakes warm in the oven while you cook the remaining batter. 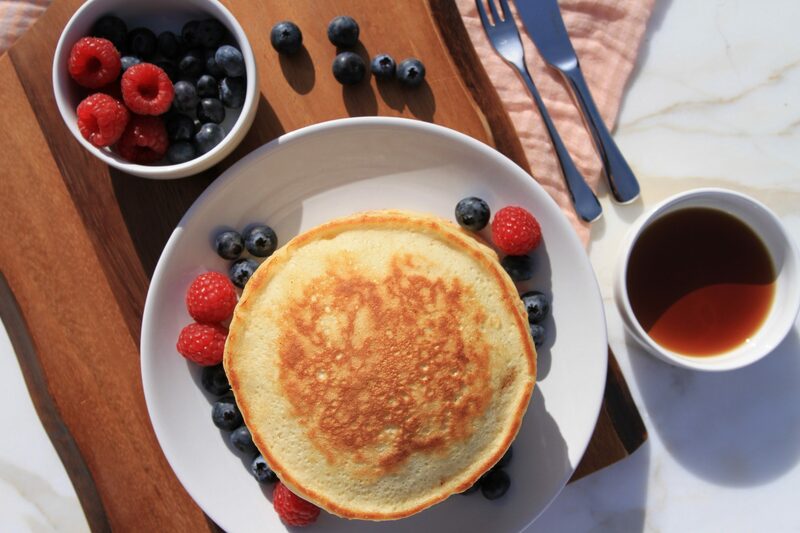 Serve with maple syrup, butter and fresh fruit. 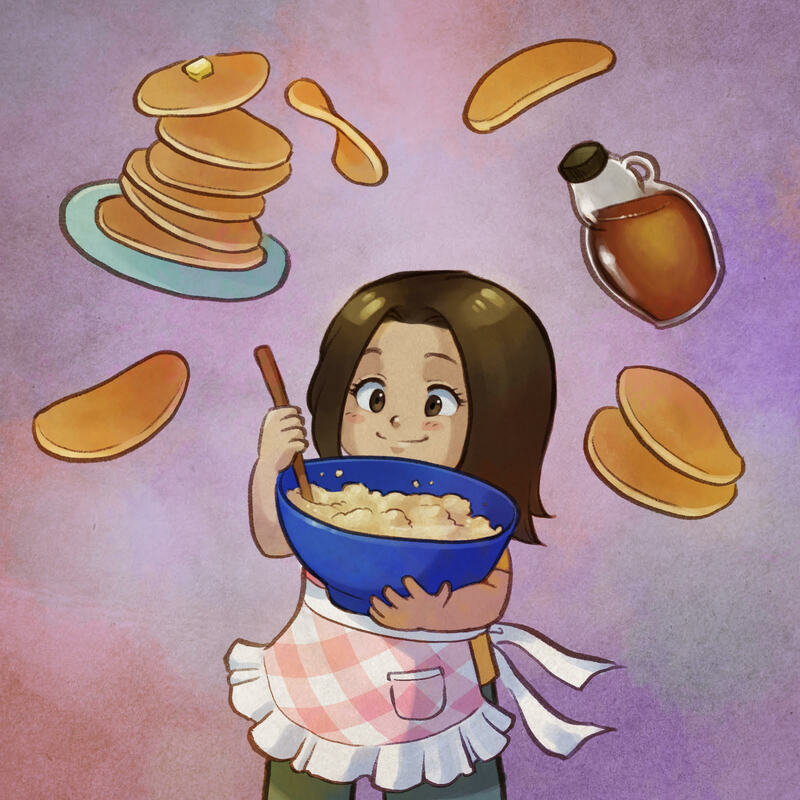 What makes pancakes fluffy? Air! 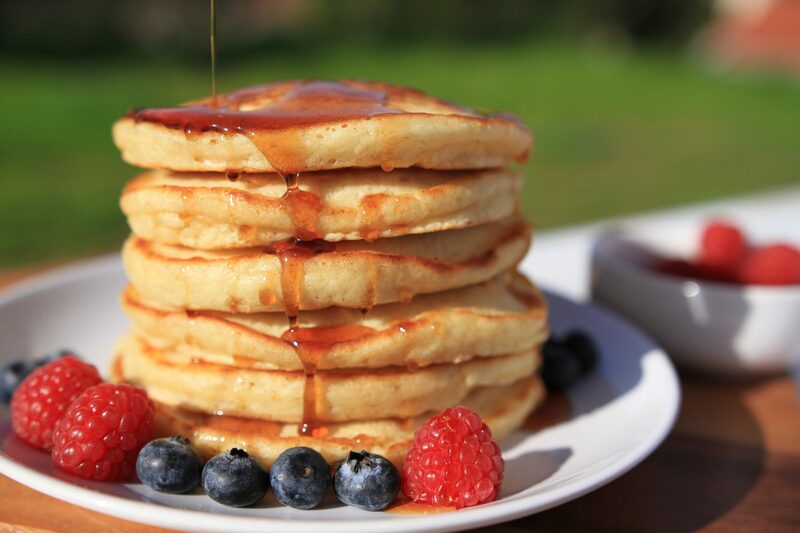 The acid in the buttermilk and the sour cream reacts with the baking soda to create the rise in fluffy pancakes. Also, baking powder by itself, contains baking soda, cream of tartar, an acid, and cornstarch, which causes the batter to expand when cooking. However be careful not to over-mix your pancake batter until it looks smooth. This will result in tough, rubbery and flat pancakes because there are fewer and smaller air pockets. The batter should be lumpy. What is buttermilk? Back when people made butter from milk, buttermilk was the leftover liquid after churning butter. The liquid fermented overnight and the milk sugars became lactic acid, giving it a tangy flavor. Now most folks buy buttermilk from the store. Store-bought buttermilk is made by adding bacterial culture to milk. Buttermilk can be used to make biscuits, pancakes or put in batter for frying chicken. It is thicker than milk but not has heavy as cream and is low in fat. I wrote this poem when I was 12 years old for my elementary school newspaper “Henderson Puppy Prints”. My classmates wrote poetry and riddles about animals and flowers. For some reason, I was the only one who wrote a poem about food. Little did I know that I would create a food blog 20 years later. Funny thing is, I had no idea what buttermilk even was at the time!